NEW YORK – Real-time “watch data” providing sharp insights and fast intelligence enables over-the-top (OTT) video streaming service providers to identify, manage and analyze user behavior and create more effective programs for them, as well as retain viewers, according to NeuLion executives. NeuLion clients including the National Basketball Association (NBA), National Football League (NFL) and Univision use NeuLion’s platform to distribute and monetize their content across just about any Internet-connected devices, Phil Green, NeuLion SVP of business development, said July 24 during a session called “Using Consumer ‘Watch Data’ to Grow Your OTT Service” at the Smart Content Summit East event, part of the Media & Entertainment (M&E) Day at the Microsoft Conference Center. The 2018 M&E Day also included Content Protection Summit East and Entertainment Production in the Cloud (EPIC) conference tracks, providing M&E technology teams valuable insights into the creation, production, distribution, security and analysis of content. “The key” for all NeuLion customers is that they “take our data, they leverage it, they get a better understanding of who’s watching what content, where they’re watching it [and on] what device – and, therefore,” they can figure out how to “best monetize it,” Green said. NeuLion customers also “get better engagement with the end user, long watch time, reduced churn [and] increased engagement,” he said. Those customers then come to NeuLion and ask questions based on the data, such as what the best marketing channels are, what steps they can take to reduce churn, how they can get viewers more engaged with their content and how they can transition viewers from free to paid content, he told the summit. “The hard part when you’re working with data … is collecting that data because it’s in a whole bunch of different locations, in various different formats,” David Dwyer, NeuLion VP of analytics development, went on to say, noting that the three major types of data that NeuLion works with are watch data, customer data and support data. From the data, NeuLion can tell its customers what the churn rate is, as well as segment viewers so customers can communicate with viewers and suggest what kind of promotions customers can offer to retain customers, Dwyer said. The data can also be used to measure the effectiveness of free trials, he pointed out. NeuLion customers can also use the data to get a better understanding of why customers are opting to drop an OTT service – such as if there’s a price issue or the user’s credit card failed, he said. Of the latter, he said NeuLion might suggest offering a grace period to retain a customer if a payment couldn’t be processed with their card. 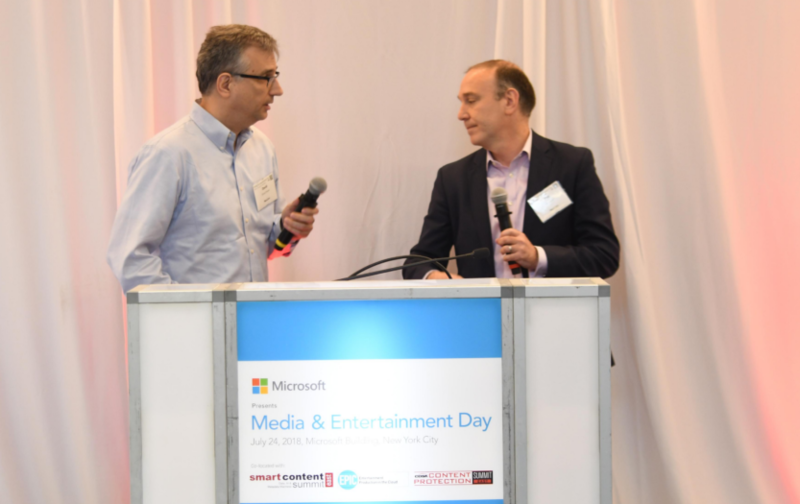 The 2018 Media & Entertainment Day was presented by Microsoft, with sponsorship from IBM Watson Media, Amazon Web Services, IBM, LiveTiles, Microsoft Azure, NAGRA, NeuLion, Ooyala, EIDR, GrayMeta, MarkLogic, Qumulo, Avid, Cloudian, SoftServe and TiVo. The event was produced by the Media & Entertainment Services Alliance (MESA), the Content Delivery & Security Association (CDSA), the Hollywood IT Society (HITS) and the Smart Content Council. Click here for audio of the NeuLion presentation, or click here for the presentation slide deck.